Award winning Rapper from the West Midlands in the UK. Featured on BBC Radio 1, BBC 6 Music and BBC radio Shropshire and BBC News He is a lively performer who likes to involve the crowd in his hard hitting and energetic performances. Trademark Blud is a talented wordsmith that is making big waves playing live all over the UK sharing stages with the likes of Dizzee Rascal, Talib Kweli, Smiff N Wessun, Wretch 32, Akala, The Mouse outfit, Skinnyman, Bronze Nazareth, Mystro, English frank and Invasion Alert, as well as playing at large festivals with acts such as Ghostface Killah, Your Old Droog, The Four Owls, Jeru The Damaja, Earl Sweatshirt and many more. 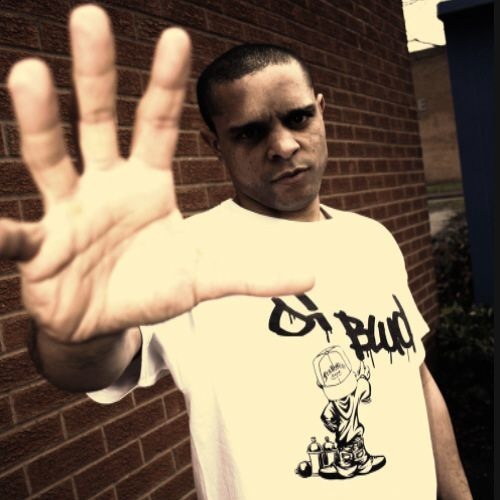 As a battle rapper he has featured on Don’t Flop and Spitroast Battles, as well as doing numerous freestyle performances for channels such as BBCiplayer, Globalfaction, Fliplife TV and Titan TV. His debut Street Album Tricks of the Trade was a bandcamp bestseller and has had over 10 songs from it featured on BBC radio. This brought him to attention of the American record label Platformz Music of which he released the ep ‘Blud on the Brain’ with in 2014. Trademark was the 2015 Hip Hop act of the year at the Midlands Independent Music Awards, Song Of the year (2014) and live performance of the year (2016) on BBC Radio Shropshire His second Street album Tricks of the Trade 2 was also a bandcamp bestseller and again had a high number of songs featured on BBC radio.